Enjoy our peaceful setting along the beautiful cascading Millstream while visiting wonderful Woodstock, New York. Just a short easy walk away is the Village Green and Woodstock's shopping, dining, and galleries. Located in the Catskill Mountain Preserve, the Woodstock Inn on the Millstream is surrounded by beauty. We are a charming country motel with a bed and breakfast ambiance. 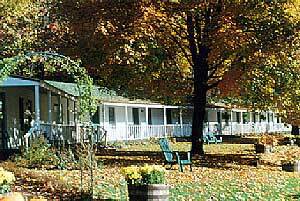 Our 18 private motel units and efficiencies are tasteful, quiet and newly renovated with cable television. Enjoy our delicious, bountiful continental breakfast inside our sunny lobby or eat streamside on the lawn.